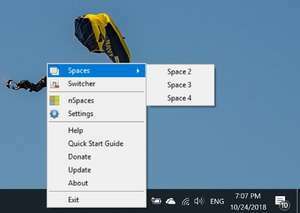 nSpaces is a free tool which can multiple the number of desktops available in Windows, similar in function to popular Linux-based desktop programs like KDE or gnome. For some, the advantages of having multiple desktop spaces can make a big difference in terms of productivity or even sanity. With nSpaces, you have manage several different desktops with different styles. That is, you can customize the backgrounds and color schemes of the additional desktops which can be accessed with ease through keyboard shortcuts. For security reasons, you should also check out the nSpaces download at LO4D.com which includes virus and malware tests. Additional screenshots of this application download may be available, too.